Sarah Hurley 365 (Formerly Sarah Hurley Challenges): Season's Greetings. 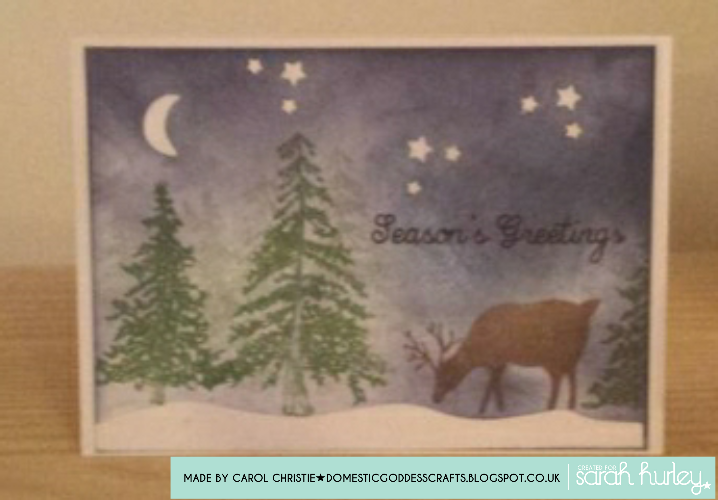 Hello, it's Carol here today and I thought I would share a card using a set of Sarah's new Christmas Stamps. I am not an inky crafter, as many of you will know, but the Woodland Christmas Stamps just screamed inky fun to me. Here is how I made it. 1 Measure up a piece of white card for your base, Use Versamark on the snowy border stamp, moon and stars and stamp them onto the card. Cover with white embossing powder and heat. 2 Ink up the tree stamps with green ink and stamp onto the border, I stamped them twice in different places to get a shadowy background effect. 3 Ink up the deer and stamp him. 4 Get inky with some Distress Ink and make your card look like a night scene. 5 Stamp your sentiment using Archival ink. 6 Put your inky scene onto a card blank. Thanks for popping by today, have a great weekend, Carol.